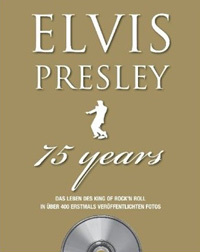 The 384 book "Elvis Presley" will be released by the German Paragon-Verlag December 2009. This biography should contain over 400 unpublished photo's according to the press-release (ISBN: 1407580973). Who wrote their press release - Joe Tunzi?!?!? If this book has 400 unpublished photos I'll buy everyone here a drink. Me thinks 400 UN-Published photoes is a bit far fetched!